After teaching for over a decade and observing hundreds of classes, I can attest to the dangers of too much “teacher talk.” However, is teacher talk, more commonly called “direct instruction,” always a bad thing? What causes student boredom? The fact is, no clear-cut reason has ever been established for what students mean when they say they are bored in schools. In a 2003 review of the academic literature on boredom, Stephen Vodanovich concluded that there really is no agreed-upon definition of what boredom is (Vodanovich 570). One study Vodanovich found equated boredom with “monotonous or repetitive activities;” in another study it was equated with “a state of relatively low arousal and dissatisfaction which is attributed to an inadequately stimulating environment” (Vodanovich 570). These two definitions, while somewhat different, do present us with a starting point in trying to define what students mean when they say they are “bored” in school. Monotony, repetition, and inadequately stimulating environments are likely to cause student boredom. While this seems obvious when reading it here, the reality is it can happen in classrooms across the world (and in department meetings!). When planning, it is imperative to keep these causes in mind. To find out definitively the reasons why students feel they are bored in school, a few years ago, a team of researchers began conducting what is perhaps the largest study on student boredom ever undertaken in American schools. Beginning in 2003, the group of scientists and educators from Indiana University set out to measure precisely what students meant when they said they were “bored” in class. The researchers’ intent was to isolate the factors inducing boredom and determine how they could use the student feedback to strengthen classroom engagement. What is now known as the High School Survey of Student Engagement Institute (HSSSE), these researchers administered a questionnaire to students across the country in hopes of figuring out just how engaged—or not engaged—high school students were. In 2009, HSSSE published a report on their findings. 103 schools from 27 states participated and 42,754 students answered survey questions about their classroom experiences. The data told the researchers at the institute a telling story about the state of student engagement in American classrooms. The researchers at Indiana University defined boredom simply as a “temporary form of dis-engaging from school” (Yazzie-Mintz 6) then asked students two very specific questions about it in the survey. Students were asked the following: “Have you ever been bored in class in high school?” and “If you have been bored in class, why?” The scale of the HSSSE report makes their findings particularly valuable. Nearly half of all students reported being bored every day they were in school. 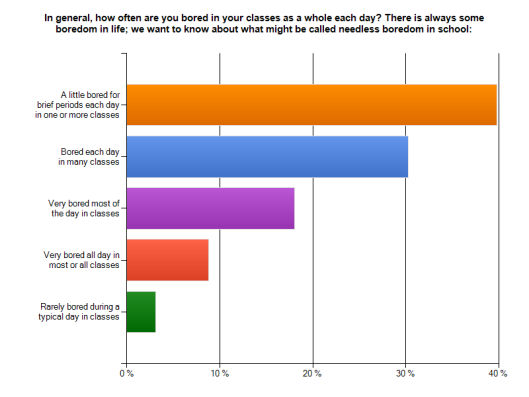 17% of students polled for the 2009 report indicated they were bored in every class they took. Only 2% of students reported never being bored in school (Yazzie-Mintz 6). This means that out of over 42,000 students, only about 850 reported that they were always interested in what was happening at school. These results mirror closely what Wiggins found in his single-school survey. 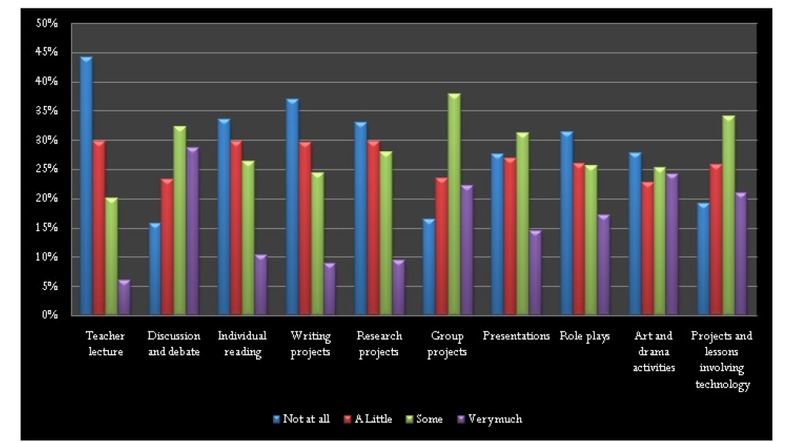 For students, the most popular classroom activities in terms of engagement were discussion and debate, group projects, and projects and lessons involving technology. The 2009 HSSSE report made it clear to educators that students respond better to hands-on inquiry-based learning and not direct instruction (Yazzie-Mintz 11). So, if you are a teacher utilizing direct instruction frequently, the statistics indicate that between 1/3 and 2/3 (or more!) of your students will likely be disengaged and probably bored during your talk. I learned this lesson the hard way. I can remember one lesson in particular that really stunk. At the time, I thought my idea was going to be a dynamic way to bring Greek history to life. I spent the better part of a weekend at the library researching the intricacies of the ancient Athenian political system. I created a PowerPoint presentation that touched on key facets of Athenian democracy from the Areopagus to the Boule. I felt my presentation was good—so good, in fact, I bet it could have been given to a class of graduate students. I was so excited that week to lecture about the Greeks! I had even found a flow chart describing how Athenians participated politically. What freshman in high school world history would not want to hear that explained? In what was my first year or two of teaching, I found nothing odd about the fact that during the presentation, I would be the only one doing the talking. This is what all my college professors did, I reasoned. When I gave my presentation, I talked to my students about how Solon laid the foundation for Athenian democracy and how the reforms of Cleisthenes organized voters into demes to limit the power of the aristocracy. Throughout the course of about twenty-five slides, I broke down the nature of the Athenian political system as my students sat and listened during the 70 minutes of class. I did a great job of explaining the intricacies of Athenian politics; my graduate school professors would have been so proud. The only problem was my audience was about twenty-five fourteen-year-olds who after politely listening to me for a few minutes became more interested in what was for lunch than they were in my telling them about the history of ancient Greek politics. My excitement giving the lesson quickly dissipated as I realized the students did not care that much about ancient Greece—or at least my version of ancient Greece. I knew by looking into the eyes of my students as I talked about Solon that I had lost them. As I progressed in my teaching career, I realized that the more I lectured, the more I bored many of my students. In fact, my Greek democracy presentation became legendary in its ability to induce boredom. I even used it to threaten students if they acted up. “Hey, if you guys don’t behave, I can always give my Greek democracy presentation,” I would say to nervous laughter. The reality was my students did not hate history. My students just preferred to be active in the discovery process instead of having me discover history for them. I found that very few students wanted to sit for an entire class period and listen to me talk. Over the years, I found myself editing more and more out of my presentations in hopes of engaging students. In fact, I stopped giving the Greek democracy presentation all together. After a few years of teaching, I realized I was not as successful as I thought. I needed to listen to my students through surveys and daily feedback about what was and was not working for them. I needed to tailor my classroom activities around what they liked to do. In short, I realized a student-centered classroom was essential if I was going to engage, inspire, and get students to love history. Vodanovich, Stephen. “Psychometric Measures of Boredom: A Review of the Literature.” Journal of Psychology 137.6 (2003): 569-595. Web. Wiggins, Grant. “Fixing the High School—Student Survey, Part 1.” Granted, and…~thoughts on education by Grant Wiggins.” N.p. 21 May 2014. Web. Yazzie-Mintz, Ethan. “Charting the Path from Engagement to Achievement: A Report on the 2009 High School Survey of Student Engagement.” Center for Evaluation & Education Policy. (2009): 1-26. Web.